OK, So What Can I Do? Restorative Justice (RJ) volunteer facilitators are asked to attend a conference as a community member once prior to an initial interview, and once more before the requisite facilitator training that takes place twice per year- in the fall and in the winter. Victim Impact class facilitators must attend a 24hr training in the spring and participate as an observer in a 6 week session prior to facilitating. Mediators must have successfully completed a professional 40 hour mediation training to volunteer for our program. All volunteers are asked to commit to joining a team for at least one year. The teams generally meet once a month for 2 hours to debrief cases, review new policies, or for in-service training. It all starts with your interest, an application, an interview and an introductory training. 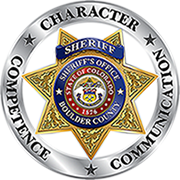 If you are interested in volunteering for any of the above positions, please fill out the volunteer application and submit to Restorative Justice Department of the Boulder County Sheriff’s Office .